Museum quality dinosaur claws. Acrocanthosaurus claw, Allosaurus claw, Camarasaurus claw, Deinonychus claw, Dromoeosaurus claw, Edmontosaurus claw, Megaraptor claw, Ornithomimus claw, Thescelosaurus claw, Therizinosaurus claw, T-rex claw, Tyrannosaurus rex claw, Utahraptor claw, Velociraptor claw. 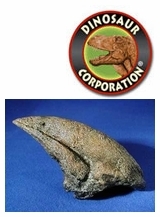 Dinosaur claws are cast in durable polyurethane resins.